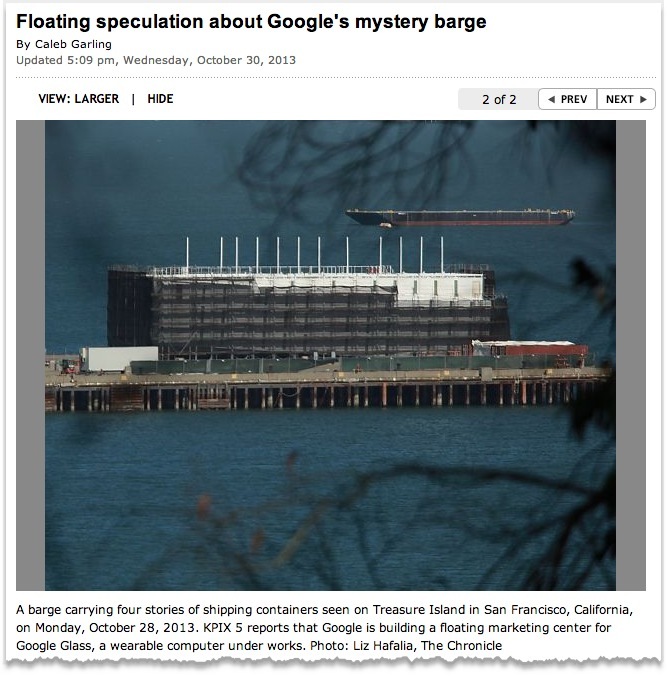 Google Barge Mystery - An Offshore Coding Platform? A mystery barge stacked with four stories of shipping containers anchored in San Francisco Bay is linked to Google but Google won't say what it is. SFGate.com (above) thinks it might be used as a store to sell Google Glass and other hardware. If it is a store then it's nothing like the plush gleaming glass and metal Apple stores, which are moored in high traffic malls and in the centers of large cities rather than along seedy waterfronts with poor access. Google, Facebook, and other large Silicon Valley tech firms have been keen to see US work restrictions eased on foreign engineers but progress on this issue has been very slow. Google loves to find a way around silly government rules, such as taxes with its "double Irish, Dutch sandwich" Bermuda dodge, why not employment rules too? My wild guess is that Google's barge is being set up as floating live/work platform for legions of overseas software engineers and will be moored in international waters just a few miles off the coast of California, easy enough for Google's project managers to visit and supervise their work. Normal tourist visas will allow the programmers to jump ship for some R&R in San Francisco and Las Vegas. Last Friday, Cnet's Daniel Terdiman cast a spotlight on a strange four-story barge made of shipping containers under construction near Treasure Island. The barge is registered to a (shell) company called By and Large LLC, which Terdiman tied to Google. I later spoke with Brad McCrea, director of permitting for the Bay Conservation and Development Commission, who confirmed that his department had meetings with Google representatives about the structure and the requirements for getting a permit to have it moored. ...The floating data center and the Google Glass store are the two going theories. The former is bolstered by Google's filing a patent for a structure full of computers that is powered by waves - though companies file patents for things they never build all the time. The latter is going off sources close to KPIX who said it was a store for the upcoming release of the wearable technology and would be docked somewhere near Fort Mason, on the north side of the city. ...A similar structure has appeared in the harbor in Portland, Maine, also owned by By and Large LLC.